I’ve started a discussion group on LinkedIn around a topic near to my passions- The early One for One movement. I believe we owe the birth of this idea to TOMS shoes but since then I’ve seen several other companies rise to the occasion in all different categories. Come on over to the LinkedIn group and share your thoughts! I’m very proud of the success and fun we had with our WellPoint holiday toy drive providing happiness to the families at the RAIN center in Camarillo, Ca. This was the first year we used social media for our internal Blue Crew programs. I designed the social media strategy using Yammer to seed our message to company employees. Using an Amazon Wish List helped make the wishes more real and provided reporting and tracking on the gifts that were received or needed. Outreach was driven through Yammer (facebook for companies) where we created a new group for the Blue Crew and enlisted our colleagues to join and spread the word about the online forum. Building this group created an opt-in audience for our future campaigns too. Employees who provided toys or furthered our cause were awarded badges and called out on the news feed. Every day we would highlight a special wish reminding everyone how little it costs to make a difference. 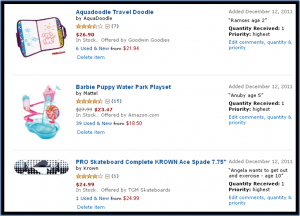 And with the Amazon wish list we eliminated the hassle of shipping so all employees from New York to San Diego could participate- and heavier toys (like a skateboard for Angela that came from a colleague in Maine) were not left out. The program also acted as a Yammer sign up campaign though I don’t have the stats on that. Because the conversations we hosted were engaging and viral, we saw daily new sign-ups to the Yammer site that had been online for over a year. The Blue Crew had another great success with its holiday toy drive for RAIN transitional living facility located in Camarillo, California. WellPoint associates from across the country heard about the toy drive and donated 64 gifts for the children and families, far exceeding the wish list of 27 items. Many thanks go to Vicki Karayan, Marketing Coordinator, Sr. who organized the drive while Suzanne Appel, Internet Marketing Manager, drove internal awareness for the drive. “Day by day the Amazon boxes arrived and we saw the kids’ wish list fill up. It was so exciting to feel that kind of generosity from these amazing WellPoint Associates,” said Suzanne. RAIN supports families in our community trying to get back on their feet in this tough economy. Way to go! !